One of the most interesting pink wines in California, the Arnot-Roberts Rose is also one of the most sought after wines in the state year after year, it’s a crisply dry and delicate wine with a refined pale hue that reminds me a bit of Domaine Tempier’s Bandol Rose! The 2016 is more elegant, livelier and succulent in profile than the more concentrated 2015 version, making it one of the best efforts to date from Duncan Meyers and Nathan Roberts, it is said to have a tiny amount of Tempranillo and Grenache (from the Russian River Valley) in this years wine, hence the California designation, but it’s the Portuguese varietal Touriga Nacional (Mostly Luschinger Vineyard-Clear Lake plus Amador) that is the main grape that makes this pink tick, native fermentation and gentile whole cluster pressed add to the fresh/clean character. 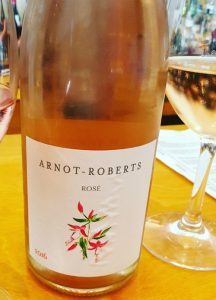 Bright with lots of verve, the 2016 Arnot-Roberts Rose shows sour cherry, strawberry, watermelon and grapefruit notes as well as spice, mineral tones and hints of salty stones, lavender, peach and rosewater in a brisk/lean form. This is a tangy refreshing wine with lingering mouth watering flavors and is well deserving of it’s hype and reputation, this is lovely summery stuff, thanks to Soif Wine Bar & Merchant in Santa Cruz for the taste and the take home bottle of this rare wine.